There’s something magical about putting a pot of vegan chili on the stove. The aroma of cumin, garlic, and chili powder slowly simmering with tomatoes permeates the house in a way that transports me to crisp, cool afternoons and the promise of wintery days ahead. It’s always soothing to come home at the end of a day and be greeted by this rich, comforting aroma. I always laugh when my daughter or dad wanders through the kitchen to proclaim, “Wow, it smells so good in here,” when onion, garlic, and mushrooms are the only ingredients in the pot. 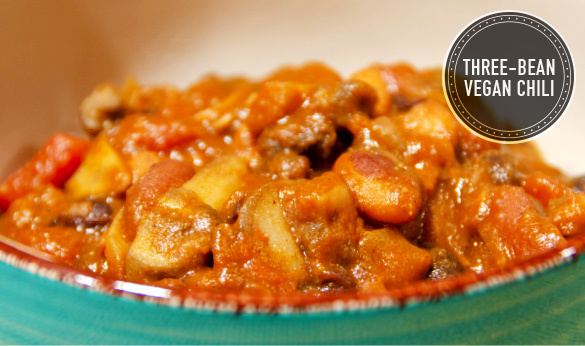 They’ve always assumed it’s the ground beef that makes the chili so tasty, but as the name implies, the secret is really the chili powder and spices that everyone loves. Knowing this, it really was a piece of cake to convert my own chili recipe into a hearty and delicious vegan chili for friends years ago. 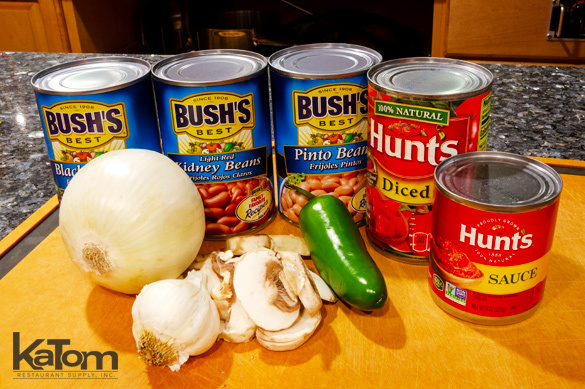 I’ve always thought it’s an added bonus this three-bean vegan chili recipe is also an easy, healthy one to follow and is perfectly suited for a crock pot or a simple simmer on the stove. 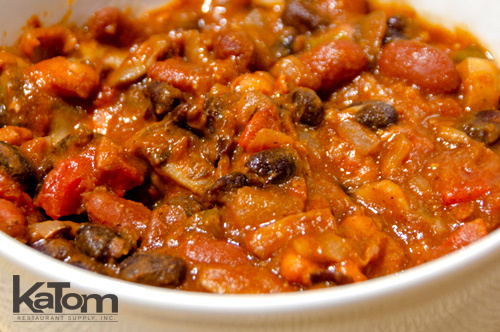 Because I use canned beans and there is no meat to cook, the simmer time on this three-bean vegan chili is all about taste preference – not about trying to cook to a specific temperature or doneness. However, any dish involving tomatoes seems to taste better after a long slow simmer, and even better a day or two later. With that in mind, this is definitely a perfect dish to double, as any leftovers will be delicious for a quick meal later in the week. There are also a variety of ways to serve this vegan chili, other than the classic “in a bowl” option. Try it ladled over a baked sweet potato, or layer it on tortilla chips with vegan cheese and chopped onions for amazing nachos! The biggest point of contention in my family with chili recipes is the tomatoes. Mom loves big chunks of tomatoes throughout the pot while I think the tomatoes should be very finely diced or pureed and thick, more like tomato sauce. However, if I have really flavorful fresh tomatoes, I like to finely dice them and add them to the pot along with the canned variety for a bright, fresh flavor. 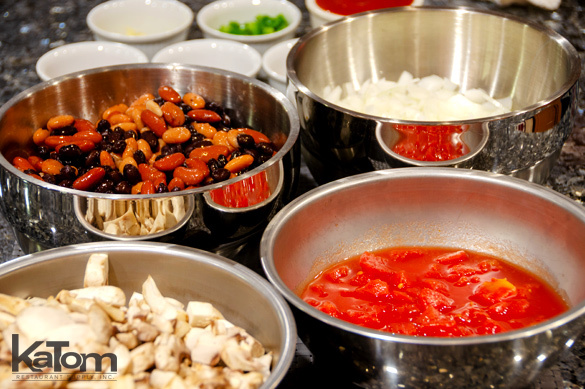 You can definitely alter that part of the ingredients to your preference, whether you choose chunks, finely diced, sauce, or some combination of them. The important part is to let this vegan chili simmer slowly on the stove at least 45 minutes to an hour, or combine everything in a crock pot and let it slowly warm for 6 or more hours. The flavors will be fabulous as the tomato, onion, and spices blend together. Add oil to a large pot over medium heat and cook mushrooms with a pinch of salt until softened, about 10 minutes. Add garlic and cook for 1 minute. Then add onion and cook until translucent, about 5 minutes. Stir in jalapeño, cumin, cinnamon, coriander, paprika, chili powder, salt, and pepper (to taste). Cook for 1 minute, stirring frequently. Stir in tomatoes and beans. Bring to a simmer. Simmer 45 minutes, stirring occasionally. If making in a crockpot: Let ingredients warm on low-medium heat for 6 hours. Serve as preferred, over potatoes, rice, or corn chips, with chopped green onion, non-dairy cheese or sour cream, and extra hot sauce if desired.